Even the “Hostile Takeover 2012” Tour can’t escape the grip of Mannibalector. Tech N9ne’s record-breaking tour is about to get a little more sinister as Brotha Lynch Hung has revealed plans to hit select dates on the West Coast. The Sac-town cannibal recently confirmed with a fan on the web that he would be making appearances on the tour as it made its way around the West Coast. Fans lucky enough to attend the shows will catch Lynch on stage as he offers up his finest cuts from albums like Dinner And A Movie and Coathanga Strangla. 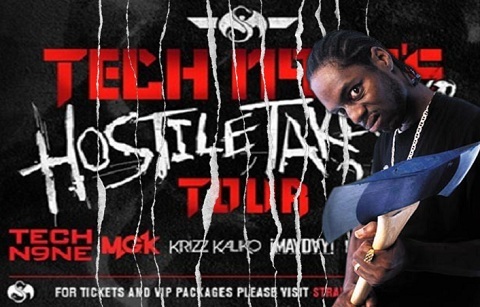 With Lynch on board, Tech N9ne’s “Hostile Takeover 2012” Tour continues to make history this summer. Stay tuned for more on Brotha Lynch Hung and the “Hostile Takeover 2012” Tour! Will you be catching Lynch live on the tour?